Don't waste, use everything: every little thing has a soul. 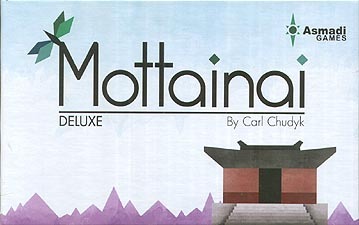 Mottainai is a card game, a new spiritual successor in the Glory to Rome line. Each player is a worker in a Buddhist temple creating works to display and sell to the visitors and tourists who come by. These works are made of materials of varying value - determining both the difficulty to complete the work and its worth to you. Completed works can be displayed in your Gallery to train your helpers, or in your Gift Shop to allow you to make sales. Each work has a unique special ability. Combining and cleverly using your works is the key to victory! Double Deck Edition - play with up to 5 players.